Hannah McCook has followed up her victory in last week's Welsh women's open amateur stroke play championship at Aberdovey by winning the Irish women's open amateur stroke play title at Co Louth today. Hannah, daughter of a Press photographer, had rounds of 81, 69 and 73 for an aggregate of one-over-par 223 at the par-74 lay-out. She won by two strokes from Romy Meekers of the Netherlands. She scored 81, 70 and 74. Curtis Cup selected players Ireland's Paula Grant (Lisburn) and England's Sophie Lamb (Clitheroe) finished joint third and joint fifth respectively. Had Hannah won the Welsh and Irish titles BEFORE the GB and I team of eight for the Curtis Cup match in New York State next month was selected, she would almost certainly had been in the line-up to play the Americans. All four Scots in the field finished in the top 20. Gemma Batty (West Linton) shared seventh place on 232 with scores of 85, 73 and 74. Par 222 (3x74) SSS 77. CSS 80 (r/o), 76 77. 232 G Batty (West Linton) 85 73 74, C Gainer (Eng) 81 78 73. One of the few times Hannah McCook was in the Irish rough! 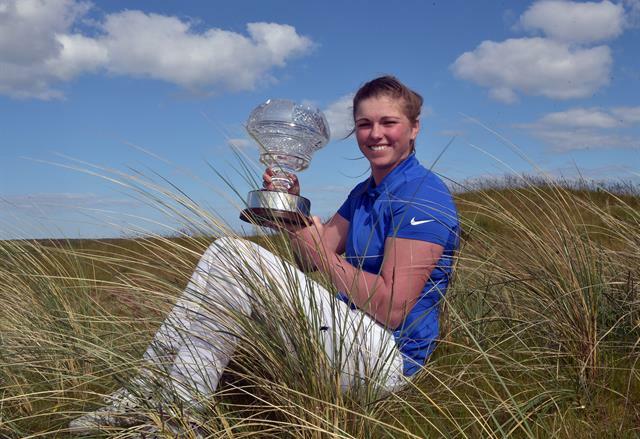 Overnight leader Hannah McCook from Grantown on Spey in the Scottish Highlands was today crowned Irish women’s open amateur stroke-play champion at Co Louth Golf Club, having won the Welsh women's equivalent at Aberdovey GC just seven days ago. "This is very weird! I’m not quite sure what’s happening!” she said while holding on to the Clarrie Reddan and Philomena Garvey Trophy. In the final group, alongside Romy Meekers (Netherlands) and Ebonie Lewis (England), McCook held the narrow advantage from the start but birdies on the first and sixth extended that cushion. Making the turn with a two-stroke shot lead over Meekers, McCook saw her tee shot on the par-5 11th find one of Co. Louth’s newly redesigned pot bunkers. The resulting bogey narrowed her lead to one but the Scot’s confidence is sky high and she kept her cool. A busy summer of golf awaits McCook as she heads back to Scotland for a Scottish Sport press day, but with two wins now under her belt, the goals will have to be re-evaluated from here. The English Team of Caitlin Whitehead, Sophie Lamb and Ebonie Lewis won the International Team event. Ireland's Paula Grant (Lisburn), like Sophie Lamb a G B and I Curtis Cup team selection for next month's match in New York State, finished tied third on 288 - five behind the winner -after a final round 75. Gemma Batty (West Linton) finished joint seventh on 232 with scores of 85, 73 and 74. The two other Scots in the field, Eilidh Briggs (Kilmacolm) and Chloe Goadby (St Regulus), both made the top 20. 255 J Browne (Kilkenny) 85 84 86.